"Power Rangers Megaforce" is the hit television program about five teenagers who are chosen to defend the Earth from an alien invasion. On top of that, these five individuals must maintain their civilian lives along with their secret identities. At their disposal are an arsenal of powerful weapons and robot vehicles called Zords. Troy is the Red Ranger who leads the rangers in combat, while showing superior fighting skill and martial arts discipline. Noah is the Blue Ranger, who is highly skilled in technology and his high intellect helps him with battle strategy. Emma is the Pink Ranger, who is an environmentalist and has an interest in BMX bikes. Just don't be fooled by her sweet nature, because she is a born fighter. Gia is the Yellow Ranger, who like Troy excels in Martial Art along with her studies. Her confidence is unshakable in the heat of battle, also her dependability to the other rangers. Jake is the Black Ranger, who in his civilian life is a fun loving guy, but when it is time to fight his agility helps the others in battle. All five face the threat of alien insects from space who wants to conquer Earth. These five warriors are the latest in a long line of defenders that have kept the Earth safe from evil. The Ancient Earth Guardian Gosei helps the rangers in their time of need and also gives them wisdom to keep up their morale. The Power Rangers will need all the help they can get against this aggressive threat who will stop at nothing to take over. It is up to the rangers to stop this invasion and save the Earth from the fate of being an alien colony. On Halloween, the scariest night of the year, the Rangers have a strange encounter with a mysterious cloaked Medium who conjures "visions" of monsters past. When Cyborg Vrak, Metal Alice and the Messenger launch a vicious attack against the Power Rangers, it will take all their powers and abilities to save the Earth. The Rangers' victory over the Warstar aliens is short-lived when they discover Metal Alice has tunred Vrak into a powerful and menacing cyborg. Admiral Malkor awakens from his cocoon stronger than ever and determined to destroy the Power Rangers. The Rangers must save the day when Metal Alice attempts to derail a passenger train. Meanwhile, Robo Knight comes closer to understanding humans when he meets a young boy. When Bluefur and Bigs use the Aurora box to become even more powerful, Gosei and the Power Rangers must pull out all the stops to defeat them and save the earth. A dream snatching monster preys on Emma and other humans, eating away their goals and ambitions. With one Ranger down, the team must figure out how to defeat the monster before Emma is lost forever. Gia and the other Rangers are captured by a monster who feeds on human laughter. It's up to straight-laced Noah and no-nonsense Robo Knight to find a way to save their friends. The Rangers must find and retrieve a powerful ancient weapon known as the Wild Sword, but Vrak is determined to harness its power for himself. While the Rangers are unsure about how to work with the newly-arrived Robo Knight, Vrak captures the robotic Ranger in an attempt to reprogram him for his own nefarious purposes. The mysterious Robo Knight joins the Power Rangers. Can he help them defeat toxic monsters that threaten the earth? Episode 7 - Who's Crying Now? After Troy deals with some small-minded bullies at school, the Rangers square off against a more dangerous bully, Creepox. When a monster attacks the city with music that produces physical pain, the Rangers must fight back in an unorthodox way with a song of their own. Best Friends Gia and Emma are turned bitter enemies by a vicious monster, Beezara. Meanwhile, the guys are captured by "queen bee" Beezara and turned into her drone slaves. As the Rangers learn that concentration is essential to perfecting their Ranger skills, they are distracted by a civilian falsely claiming to be a Ranger. When Noah has trouble lifting Jake's heavy weapon, he begins to doubt his abilities, until he learns that believing in yourself is all that's necessary to get any job done. The alien invaders send Scaraba down to Earth to study the human race and determine how best to defeat them. In the meanwhile, Troy finds himself face-to-face with Creepox. Gosei chooses to form a new team of teenage heroes to defend the planet from evil aliens that have made their way to Earth's orbit. Power Rangers Megaforce is currently available to watch and stream on Nick. 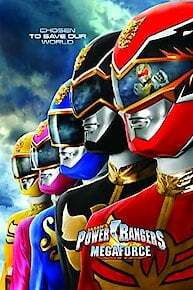 You can also buy, rent Power Rangers Megaforce on demand at Netflix, Amazon, Vudu, iTunes online.